Lat: 34.446389° N Lon: 118.1968° W Elev: 2600 ft. 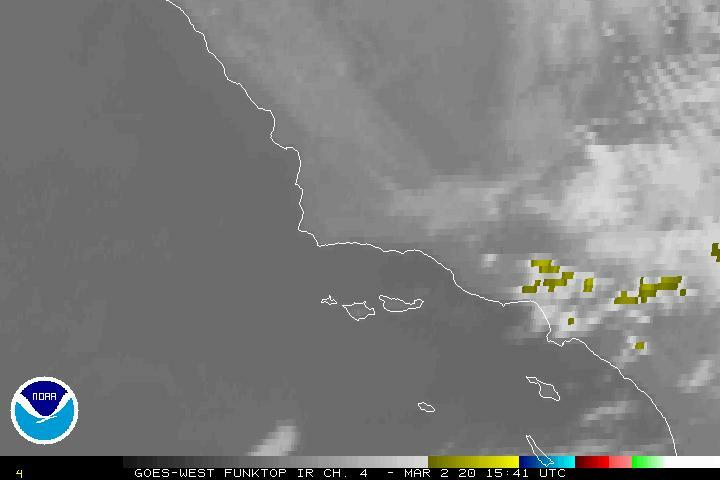 Sunny except for morning low clouds and fog on the coastal slopes. Highs from the lower to mid 60s at low elevations to the 50s at high elevations. Southwest winds 15 to 25 mph with gusts to 40 mph. Mostly clear. Lows from the mid 40s to around 50 at low elevations to around 40 in colder valleys and peaks. Southwest winds 15 to 25 mph with gusts to 35 mph. Sunny in the morning then partly cloudy. Highs from the 60s at low elevations to the 50s at high elevations. Areas of northwest winds 20 to 30 mph with gusts to 45 mph. Winds strongest through the interstate 5 corridor. Partly cloudy in the evening then mostly clear. Lows from the mid 40s to around 50 at low elevations to around 40 in colder valleys and peaks. Northwest winds 20 to 30 mph. Sunny. Highs from the upper 60s to mid 70s at low elevations to the upper 50s to mid 60s at high elevations. North winds 15 to 25 mph. Clear. Lows from the lower to mid 50s at low elevations to the mid to upper 40s in colder valleys and peaks. Sunny. Highs from the mid 70s to lower 80s at low elevations to the mid 60s to around 70 at high elevations. Clear. Lows from the mid 50s to around 60 at low elevations to around 50 in colder valleys and peaks. Sunny. Highs from the mid 70s to mid 80s at low elevations to the mid 60s to lower 70s at high elevations. Mostly clear. Lows from the mid 50s to around 60 at low elevations to the mid 40s to lower 50s in colder valleys and peaks. Mostly clear. Lows from the mid to upper 50s at low elevations to around 50 in colder valleys and peaks. Sunny. Highs from the 70s at low elevations to the 60s at high elevations.